New England Patriots coach Bill Belichick might've been caught checking out supermodel Chrissy Teigen at Saturday's White House Correspondents' Dinner. 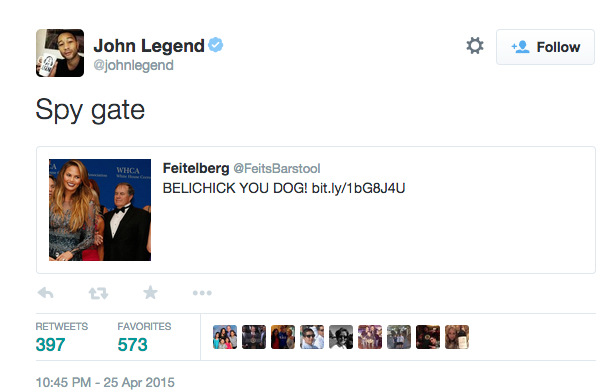 Teigen's husband, singer John Legend, responded with a fantastic zinger directed at Belichick. New England Patriots coach Bill Belichick maybe, possibly was photographed checking out supermodel Chrissy Teigen at Saturday's White House Correspondents' Dinner. Not that Belichick can be blamed—SI.com has shown why numerous times, from her latest feature in the SI Swimsuit Issue to her appearance at Comedy Central's roast of Justin Bieber, as have numerous other outlets. But still—the cameras, Bill. Come on. You're at the White House Correspondents' Dinner. Yes, that's former Wisconsin center and college basketball's consensus national player of the year Frank Kaminsky who might also be "incriminated." But when Teigen's husband, nine-time Grammy Award winner John Legend, took notice of Belichick with this mic-drop of a tweet, the headlines wrote themselves. This is all in good fun, so we're sure Belichick would be happy to clarify his glance in an interview with reporte... oh, nevermind.